Ireland has a strong history of social economy organisations and collective action, noted by such organisations as the GAA, the agricultural co-operative movement, and the credit union movement. 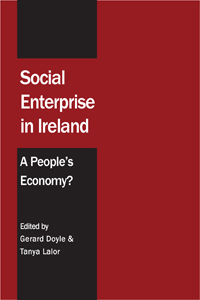 SOCIAL ENTERPRISE IN IRELAND: A PEOPLE'S ECONOMY? aims to examine the concept of social enterprise, and what part it can play in the renewal of our economy and in addressing key issues facing Irish society. The economic context of Ireland provides an opportunity for communities to reconsider their relationship to their local economies, and to take an active role in shaping them, through social enterprise development. Its thrust is to highlight to community and voluntary organisations, policy-makers and academics the potential of social enterprise in providing employment, strengthening the local economy and enabling communities to have greater self-determination.